February 2005 Thought you might like to see the attached picture of my abode. I noticed that there were no cars parked in front so rushed outside to take a photo! Yes, this is where all my stuff was created, from Instant Garbage Magazine and the Disc cartoons to the current e-mail Frescos and Phil Stamp envelopes. Well, apart from the current batch of The Invisible Man, which I did while on holiday in Wakefield. You may recognise the house - indeed, you may well spot it again tomorrow. I've lived here ever since Dad built it in 1952. 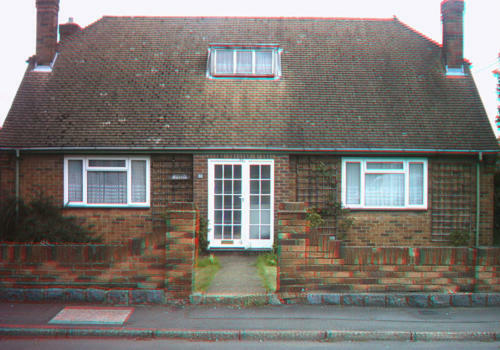 It was originally named 'The Bungalow' because it was, at that time, the only one in the street - the council would only allow Dad to build it if we had a window in the roof, so it didn't look out of place. Of course, this then opened the way for any other bungalows to be built without such a window. It did mean that we had a large loft, which, in the olden days, I used to use to show my films. After my mother, Queenie, died, Dad changed the name of the house to 'Queens' and had the current name plate made. Not a wise choice of name, I always felt, for a place with two blokes living on their own. Jack's reference to 'you may well spot it again tomorrow' refers to the Fresco strip where the bungalow makes a guest appearance. September 2005 Today went to see 'Shark Boy and Lava Girl 3D'. Excellent 3D but can't recommend the film. Seemed to be aimed at children without the slightest consideration for older viewers - even me. Still plan to buy the DVD when it comes out, though, to add to my collection. October 2005 This is a thrilling day for me. I've had a passion for 3D ever since my 3D glasses fell off with excitement while watching "Charge at Feather River" back in 1953. Since then, I've been continually experimenting with my own 3D systems but it's only now, for the first time in the history of the known universe, that I'm able to bring you an actual cartoon strip in full, true OliveramA© Color 3D! For this week only, I'm sending you TWO versions of Fresco. 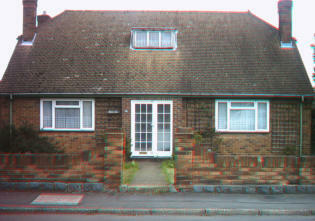 If you have access to a pair of red/blue 3D glasses, use them to view the 3D version. If not, you can read the flat 2D version using just your eyes. I realise that this won't mean a lot to you, but, for me, it marks the achievement of a lifetime's ambition! You wrote: Also, Mr Jack, are you a member of the NFT and have you seen they are doing a 3D film season in December? If not, please let me know asap as I have had a good idea (for once). I Reply: No, I'm not, and no, I haven't. Am letting you know asap! In December 2005 the NFT had a season of 3D films. The offer to Jack, referred to below, was that as an Xmas present we would buy him and Liz tickets for any of the films of his choice. November 2005 Thank you and Helen so much for your offer. I'd like to think about it before I make my choice, please, and talk it over with Liz. I'll get back to you, if I may, when I've decided. Actually, my brother recorded 'Fort Ti' in 3D from TV for me before I even had a video, on the assumption that I'd get one one day. This may not be a convenient time for you, but I've finally had time to compile a list of my preferred 3D films, so here it is. Liz says that she's not bothered about seeing the films, so I'd like single tickets, please. If you are given an option, I prefer sitting towards the front (because of my eyes and ears). The choice of showing times is not crucial, and if two performances happen to fall on the same day, this would be okay (as long as the times are different, of course). I've listed six films to give a choice, as you suggested, starting with my first choice first. Here we go, then... 1. THE MAD MAGICIAN 2. MAN IN THE DARK 3. GORILLA AT LARGE 4. THE NEBRASKAN 5. DRUMS OF TAHITI 6. INFERNO If these are fully booked and you need other choices, any of them would do, really! Found it hard to decide between ones I'd already seen (though 50 years ago) and ones I hadn't, but finally went for the latter. Tickets safely received today. Of course, the postman tried to deliver them before I was up but Liz kindly disguised herself as me and collected them from the sorting office on her way to computer class. Still very excited about the upcoming threeDness of it all! Thank you, too, for the impressive Christmas card - the first I've received. Well, at least, the first I've received that wasn't an advert. December 2005 I had the best seat in the house! "Gorilla At Large" was fairly average (but, of course, a collector's item) and the 3D was excellent. Don't believe everything you read, though. The promised "thrilling 3-D-enhanced rollercoaster ride" didn't actually appear in the movie! Looking forward to the next stereoscopics, on Saturday. Good night, Dog bless. January 2006 I was relieved that I could hear all the 3D films so well. These days, I too often find that the soundtrack, while loud enough, seems fuzzy. And there are usually subtitles on DVDs. I've discovered that Shark Boy & Lava Girl 3D & 2D is due for release on DVD on February 27th, so I shall be ordering that. Wasn't a particularly good film for adults (or even me) but the penalty of collecting is that you have to collect. And the 3D was fine. February 2006 I went on Sunday, as predicted, to see Chicken Little in Disney 3D, "The True Digital 3D Experience". A bit disappointing, really. The bits with things coming out towards the audience were excellent - they looked really solid and it worked very well. But the rest of the film hardly seemed to be in 3D at all: I had to keep taking off my 3D glasses to see if there was any separation at between the images. There was, but not much more for the background than there was for objects in the foreground. I thought that, overall, the 3D effect was nowhere near as good as that in those fifties films you sent me to see - or, indeed, as that in the anaglyph "Shark Boy & Lava Girl." As for the film itself: I've always been quite a fan of Disney (after all, they taught me all about lemmings) and their movies have usually seemed suitable for adults as well as children. This one, though, I thought was too much aimed at the kiddiwinks. Poor story, quite boring: 3/10. I was pleased that they used the Polaroid© method, though - and the poster said I could keep the Chicken Little-style green plastic glasses. I wasn't sorry I went to see it: it's good to have experience of these things and it was one to add to my virtual collection. Thank you for telling me about it - and please let me know of any others of which you might hear. As I'm sure you're aware, the popularity of 3D seems to occur in cycles and we're certainly going through one at the moment!